Astronomy may be hard science, but there's always been a whiff of Disney about it too. What else beyond enchantment could explain the ice volcanoes on Neptune's moon Triton, the helium rain in the atmosphere of Jupiter, the beads of colored glass scattered across the surface of the moon? Now you can add one more through-the-looking-glass feature to the fantasyland that is the cosmos: the green crystal rain falling on a young star in the constellation Orion. When most people think of what makes up a star, little more than gas and fire come to mind  and that's not a bad start. It's hard for much else to survive in so superhot a mass. But a star's reach is a lot bigger than we think, blasting flares and plumes high into space  and out there, things get a lot colder. Since 2003, the Spitzer Space Telescope has been studying the universe in the infrared spectrum  looking, essentially, at how different phenomena play out at different temperatures  and the upper reaches of stars has been one of its areas of investigation. Several years ago, the telescope turned its giant eye toward a star called HOPS-68, which is located in Orion about 1,350 light years from Earth. The data it gathered, like much of the information all space telescopes collect, was initially recorded and banked, awaiting the time astronomers could break it down and analyze it. That analysis was just completed and the findings were published in the newest edition of Astrophysical Journal Letters. The conclusions the scientists reached were clearly worth the wait. 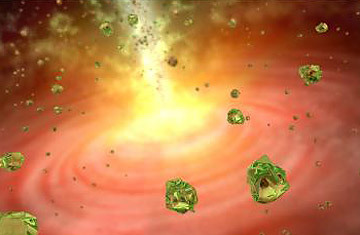 What Spitzer observed was a sort of perpetual crystalline rainstorm made of a bright green mineral of a class called olivine, pouring down on the infant star. Olivine is a magnesium iron silicate that exists throughout the universe  in distant galaxies and local comets  as well as in earthly jewelry stores, in a pristine, gem-quality form called peridot. Various kinds of olivine were also collected on the moon throughout the Apollo program. Lunar olivine was created by great volcanoes called fire fountains, which sprayed superheated lava into the sky. As the aerosolized material settled back down to the surface and cooled, it formed glass beads. It was the crew of Apollo 15 who first found green olivine  specifically, a magnesium-rich variety that goes by the name forsterite, which is also the kind that was spotted by Spitzer. The existence of forsterite in a star like HOPS-68 is not entirely without precedent; the crystals have been found in the vicinity of young stars before, but never so high up  and never behaving like rain before. While the material is created by a process of cooling, it must first be superheated, and the temperature at the above-star altitude at which Spitzer detected the green beads is just too cold  it's -280°F (-170°C)  for the silicate to form properly. But that's not a problem if the forsterite wasn't created there at all. "You need temperatures as hot as lava to make these crystals," says Tom Megeath, an astrophysicist at the University of Toledo and the principal investigator of the new study. "We propose that the crystals were cooked up near the surface of the forming star, then carried up into the surrounding cloud, where temperatures are much colder, and ultimately fell down again like glitter." Why does any of this matter  apart from the fact that it's just plain cool? The biggest reason is that it may give us some insight into how our own solar system formed. The abundance of olivine in comets is well established, but it's always been a bit of a mystery how it got there. The older theory was that the silicate formed in the heat of the disk of planet-forming matter that surrounded the nascent sun and then slowly drifted out to the outer reaches of what would become the solar system, where it mixed with the ice and rock that would form comets. The new study suggests a more active process. The olivine, Megeath and his colleagues believe, might have been blasted out by jets of solar gas rather than lazily carried out by cosmic eddies. Once in deep space, it went though the same process of aggregating into comets. To layfolk, that may be a distinction without much of a difference, but to astronomers it's an important piece of the astrophysical puzzle. All of this is just one more sign of the something-for-everyone nature of the cosmos: the scientists get their science, the rest of us get the splendor of green crystal rain. Somewhere in there, we all get a little bit smarter. See pictures of meteors striking the earth. See "NASA's Next Goal: Mars, Titan or Comet?"